The American online magazine The Fanzine has an interesting new article on the controversial topic of addiction to online worlds. It’s entitled “Five Hundred Eighty-Six Days, Fourteen Hours, Forty-Six Minutes, Eleven Seconds”, the precise amount of time the writer, Michael Louie, spent playing Final Fantasy XI, and the ensuing narrative chronicles his own complex relationship with the game, as well as the larger context of this phenomenon. Of course, Second Life is “not a game”, as anyone involved will hasten to tell you, but it shares many obvious similarities with some of these other point-based environments. Perhaps most intriguing about Louie’s article is the spectrum of emotional engagement with the game he explores — from those driven by depression to bury themselves in the game, to a mother who uses it to stay close to her overseas daughter and son-in-law (stationed in Iraq). It’s clear that as virtual worlds continue to develop, so will the variety of positive and negative ways people find to interact with them… after all, why would it be any different from the real world? RMB City’s engineering team Avatrian was a sponsor of the SLCC (Second Life Community Convention) in Tampa, Florida, 5-7 September 2008, one of the key gathering-points of the greater Second Life community. 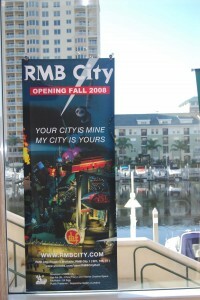 There they displayed the first poster promoting RMB City’s grand opening in Fall 2008. Read more about the event at Avatrian’s blog. “Man is made of God’s plaything, and that is the best part of him. Therefore every man and woman should live life accordingly, and play the noblest games….Life must be lived as play, playing certain games, making sacrefices, singing and dancing.” Plato, The Laws. Who is the fake Miss Avatar in the arena? 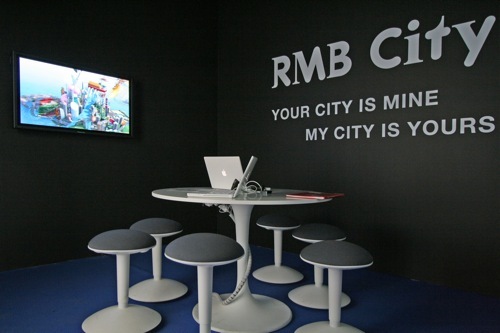 Is RMB City an arena for it’s members? Does it sound like a detective story, as well as a Hollywood film? In real world, Tracy Spaight, an experienced American game designer, declared such an interesting story. 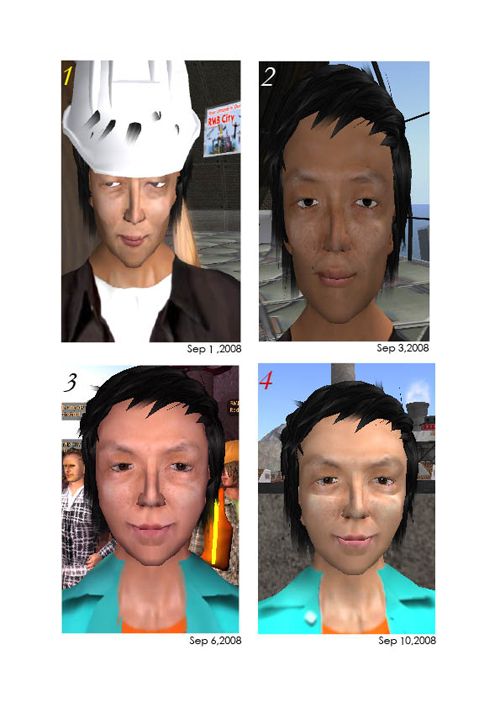 In his work with a virtual film, he found an identical virtual world case–a LegendMUD game Player, named Karyn, was killed instantly in a car accident. As a commercial group leader, Karyn not only gained respect from players (they built ‘The Garden of Remembrance’ for her in LegendMUD), but also received griefs from other virtual lands. Even Raph Koster, administrators and designers of many 3D games, wrote a well eulogy “A Story about a Tree”, praising her contribution and friendship to the virtual space. If the story stopped at the phrase, anyone can imagine what Tracy just would talk was mainly the effect that virtual world acted in real world, or how permanent death made forever logout of avatar, or Karyn’s mine stone in the consciousness of the online community. But it did not, plot went on. Tracy found that rarely any first life materials, such as picture, college, car accident, can match up with her second life: she may possible be a Norwegian, but she may also possible be a man, to be anyone. More seriously, he finally concluded that, Karyn killed herself, just the way she gave birth to herself, through fabrication. Now the issue diverted it’s direction, for this “virtual” have a deeper definition. So how to deal with the loop, “virtual” virtual? In Raph’s words, it’s nothing matter whether virtual is fake or not, the players and their social bonds give a live to the virtual world, just like the little boy make his toy real, LegendMUD players believed fake Karyn. Simply put, the real exist in people’s head, and this “real” will work in first life. But there is still one question I can not find answer in Tracy, that is why Karyn need to give avatar a perfect retreat, using real death news to cease her virtual life? She can just simply quit without clue, uninstall the game software, turn off the computer like most people do, for no third-party as police or game controller will release Karyn’s real status. Did she too dear her avatar to leave, did she regard virtual world as a arena? We can not get the real reason until Karyn tells us. But if we suppose RMB City is really a arena, then Karyn is quite welcome inside as a professional actor. 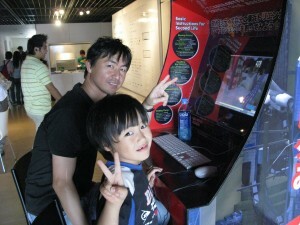 After much preparation, the “Play With Your Triennale” arcade-box made its premiere at the opening of the 3rd Yokohama Triennale, on September 12th and 13th. Cao Fei’s project for the Triennale uses RMB City as its medium, and is embodied both in the physical installation (inspired by the classic video-game arcade structure) and the People’s Worksite in SecondLife, a portion of the still-under-construction city that was opened for this event. 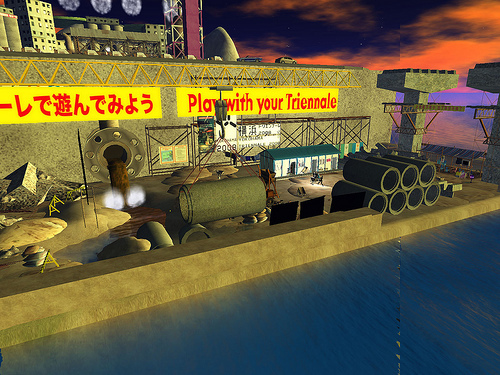 Via SecondLife, anyone from around the world can participate in the Triennale – by visiting virtually at any time, and also by submitting their creative ideas for possible realization in the Worksite over the Triennale period. On the opening days, visitors young and old came by and played with the exhibition… but perhaps the most excited were the kids, who jumped on the keyboard and within seconds were discovering the joys of flying in SecondLife. If you visit the People’s Worksite these days, make sure to say hello or こんにちは (“konnichiwa”) to Yokohama Lemon, the official avatar of the RMB City terminal at Yokohama… you may find yourself talking to some young, eager Triennale visitor as cute as the one below! See more photos in the Flickr Sets here and here. “Sprout from White Nights” at the Bonniers Konsthall in Stockholm, Sweden, focuses on “young Chinese artists at the interface of thousand-year old traditions and new technology,” and featured Cao Fei’s RMB City in a dedicated room with terminals for visitors to access the city under construction. During the opening days, many journalists and visitors were able to chat live with China Tracy via SL in RMB City. It’s very exciting that the Yokohama Triennale featuring RMB City will have its grand opening tomorrow. Please see the following announcement and postcard, and visit the Yokohama Triennale in SecondLife now! Preview Day Yokohama Time: Sep 12th 10am-8pm ;Official Opening Party : Sep 12th 6pm-8pm . Preview Day SL Time:Sep 11th, 6 pm-4 am ;the Official Opening Party : Sep 12th, 2 am-4 am. 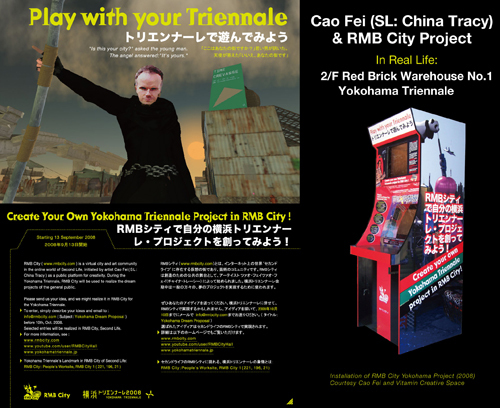 During the Yokohama Triennale, RMB City will be used to realize the dream projects of the general public. In “Play With Your Triennale”, anyone and everyone is invited to submit an artistic project, and selected entries will be realized in the People’s Worksite during the Triennale period, along with a series of special events. In keeping with the border-crossing spirit of RMB City, anyone worldwide can become an artist in the Triennale by contributing ideas, and also audiences anywhere can visit this virtual slice of the exhibition at any time. In RMB City Library, there is such a practical book that I can easily read and search in hand. 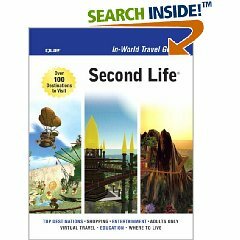 This book, wrote by Sean Percival(avatar Sean Voss) in December 2007, called Second Life In-World Travel Guide, gives me a rounded view of SL, ranging from Virtual Bootcamp, Top Destinations, Shopping, Enertainment, Education, Real Life in SL, Adults Only,to Where to live. Obviously, a sandbox is a type of space within Second Life, where anyone can build things. The interesting thing that is not explicitly mentioned by the definition above is that the sandbox is where you learn to build things in the first place. Any avatar fresh off the Orientation Island can search for “sandbox”, teleport to one, follow some brief tutorials (or click around in trial and error) and start making things. Granted, maybe they’re not very exciting things at first– cubes, cones, spheres, all with a neutral woodgrain print. But these are the building blocks of everything else. So the terminology choice is a good one, as it reflects real life. The “sandbox” is an oft-used metaphor for different aspects of grown-up human life, but here it really fits. The sandbox is where we play at building a world, and in the process, we produce the one we have. Only a few select parts of RMB City will be “sandbox” in the official SL sense, but it seems the project as a whole is nothing if not a sandbox. A place for a global kindergarten to play with forms, concepts, and experiences.